Anyone hoping to see Pakistan's civilian government hold the country's powerful military establishment to account over Osama bin Laden will have been disappointed by Prime Minister Yousuf Raza Gilani's speech on May 9. Eight days after the raid that killed bin Laden in Abbottabad, Gilani addressed his people for the first time since the attack. Speaking in Parliament, he hailed bin Laden's demise as "justice done" but fiercely defended Pakistan's army and its premier intelligence agency, the ISI, and warned Washington against any further such raids. Gilani derided any suggestions that Pakistan is not fully committed to fighting extremism  a fight that has cost the nation 30,000 civilians and 5,000 security personnel  and put the blame for the bin Laden debacle outside his country. "Pakistan alone cannot be held to account for [the] flawed policies and blunders of others," he said in one of many thinly veiled anti-U.S. jibes that peppered the speech. "Pakistan is not the birthplace of al-Qaeda. We did not invite Osama bin Laden to Pakistan or even to Afghanistan," he added. There was even an oblique reference to Zbigniew Brzezinski's 1980 exhortation to the mujahedin, in which he called on them to take on Afghanistan's Soviet occupiers, "because God is on your side." The Prime Minister conceded that bin Laden's presence in Abbottabad had exposed an "intelligence failure." But, he insisted, that failure "is not only ours but of all the intelligence agencies of the world." He claimed that it was the ISI that had furnished crucial intelligence that ultimately led the U.S. to bin Laden and that it had been the ISI that seized 9/11 mastermind Khalid Sheikh Mohammed. "Indeed, the ISI is a national asset," Gilani said, "and has the full support of the government. We are proud of its considerable achievements in the antiterror campaign." 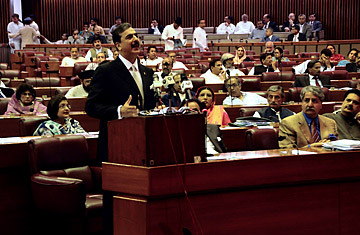 Gilani's praise of the ISI embarrassed even some of his party's lawmakers who have long criticized its role. Often described, and feared, as a state within a state, it stands accused of rigging elections, boosting jihadist proxies and destabilizing governments, including Gilani's. Human-rights groups accuse it of a litany of abuses, including disappearances and torture. "They're definitely overbearing," Nisar Ali Khan, the leader of the opposition, tells TIME. "They definitely cross the limits of their legal and constitutional powers. They get involved in matters that do not concern them." The bin Laden operation was a major blow to the ISI's prestige and carefully cultivated image as an intelligence agency capable of confronting all threats to Pakistan. "They're not as almighty as we make them out to be," says Khan. "One clear manifestation of that is they didn't know what was happening under their noses." Some have suggested that the ISI chief, Lieut. General Ahmed Shuja Pasha, should resign as a result of the episode, but Gilani made clear that he was not going to move against the intelligence agency. For Pakistan's generals, the embarrassment of bin Laden's whereabouts appears to have been eclipsed by what they see as the world's first invasion of a nuclear-armed U.S. ally. They have made it plain that they will resist any further such operations in the future  a vow enthusiastically echoed by Gilani: "Our people are rightly incensed on the issue of violation of sovereignty as typified by the covert U.S. air assault." Sovereignty is a buzzword in Pakistan at the moment. Scarcely does a day slip by without laments from opposition politicians and retired officials about its erosion. The extent to which the U.S. has been able to intervene directly in Pakistan  through drone attacks, CIA contractors like Raymond Davis and now the Navy Seal operation  has become a focus of national outrage. The difficulty for Pakistan is that it has been quietly signing its sovereignty away for years, albeit with limits. "This incident is a clear violation of a very clearly pronounced red line from Pakistan that there will be no boots on the ground," Shah Mahmood Qureshi, a former Foreign Minister, tells TIME. But that claim has now been thrown into question after the Guardian of London revealed that former military ruler General Pervez Musharraf entered an agreement with Washington 10 years ago that allowed U.S. forces to pursue bin Laden on Pakistan's soil. "The Pakistan army doesn't care much for sovereignty," says Farzana Shaikh, a Pakistan expert at London's Royal Institute of International Affairs. "But right now it's the only way in which it can salvage its reputation." Although Pakistan has launched an internal inquiry into the bin Laden matter, it will be conducted by the army's adjutant general rather than the civilian political authorities. "My fear is that this will be a whitewash," says Shaikh, "another attempt to rehabilitate the military. It is very likely that the military will emerge with its image pretty much intact." The prospect seems to be of some junior intelligence officers' being purged. It's a decision the government may come to regret. "This was a hugely missed opportunity for the political leadership to rein in the military and its intelligence services," says Shaikh. In her eyes, this was the first time since the aftermath of the civil war that led to the creation of Bangladesh in 1971 that Pakistan's civilians were presented with such an opportunity. The reason they have chosen to pass it over, she says, is a single-minded determination to hold on to power. Gilani's government has just become the nation's longest-serving civilian democratic government since 1977. Now, with its parliamentary majority fortified by the ranks of new junior coalition partners, it stands a chance at an unprecedented re-election. "The government is much more concerned with its survival," says Shaikh. Toward that end, it seems prepared to continue reading from the army's script. Already it has ceded its prerogatives in matters of foreign policy, national security and elements of economic policy. Now even Parliament seems to be under the military's sway. Gilani announced that General Ashfaq Kayani will be addressing parliament on May 15 in a rare closed-door briefing. After Gilani's speech, the military issued a press release that stated that the briefing was Kayani's idea  proving again where power continues to lie in Pakistan.